Tripp Lite's SmartRack Wall-Mount Roof Fan Kits are the ideal solution for increasing ventilation in wall-mount enclosure cabinets. Each kit features multiple high-performance fans that can be installed to the inside or outside of the wall-mount enclosure to expel heat out of the enclosure.COMPATIBLE SMARTRACK WALL-MOUNT ENCLOSURES - SRW6U, SRW9U, SRW10US, SR12UB, SRW12U, SRW12US, SRW12US33, SRW12USG, SRW18US, SRW26US, and other Tripp Lite SmartRack Enclosures that specify the use of this accessory. Increase cooling and airflow management in wall-mount rack cabinets with Tripp Lite’s SRFANWM! With two high-performance 120V fans (210 total CFM and a 50 dB sound rating), the SRFANWM kit installs easily inside or outside the roof of most Tripp Lite wall-mount rack enclosures, adding valuable airflow control to cool your equipment. The high-performance fans come with a 3-foot cord and are housed in a heavy-duty casing for protection and durability. Flexible, easy mounting allows the SRFANWM to adapt to almost any installation, and its compatibility with all of Tripp Lite’s SmartRack wall-mount rack cabinets ensures that it will be the right solution for your application. For peace of mind, the SRFANWM comes backed by a 2-year warranty. Creating proper airflow and cooling equipment housed in small spaces with wall-mount enclosures can be challenging. 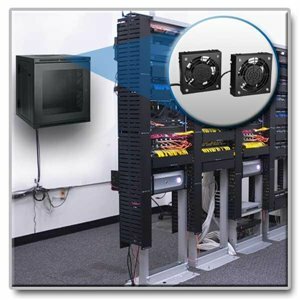 With two high-performance 120V fans (210 CFM total), the SRFANWM is the ideal solution for increasing ventilation and improving airflow in wall-mount enclosure racks. Flexible, easy mounting allows the SRFANWM to adapt to almost any installation, and its compatibility with all Tripp Lite SmartRack™ wall-mount enclosures ensures it will be the right solution for your application. The fans include a 3-ft. cord that can be plugged into any standard outlet and reliable construction for years of durable operation. Using the included hardware, the SRWFANWM can be installed inside or outside the roof of any wall-mount enclosure. Whether mounted inside or outside of the enclosure, the high-powered fans ensure that all hot exhaust air is drawn out of the enclosure to facilitate equipment cooling. The fans share a single 3-ft. AC input cord that can be plugged into any standard outlet. The SRWFANWM is manufactured using top-quality materials for a difference you can clearly see. Its included fan casings are made from durable materials that provide superior fan protection and reliable service. As part of Tripp Lite’s commitment to environmental responsibility, this fan kit is also manufactured in compliance with strict RoHS specifications. For peace of mind, it comes backed by a 2-year warranty.